The Active Forever MedELert Automatic Pill Dispenser features a secured, tamper-proof locking key system to avoid over-medication and an easy to program interface, making it a perfect solution for the elderly, hearing- and/or visually-impaired individuals, patients with a complicated medication regime, or people who simply need help adhering to a new schedule. 3 different alarm tones and a blinking light alert the patient when medication needs to be taken and will not turn off until the pill dispenser is tilted on its side to dispense the pills. 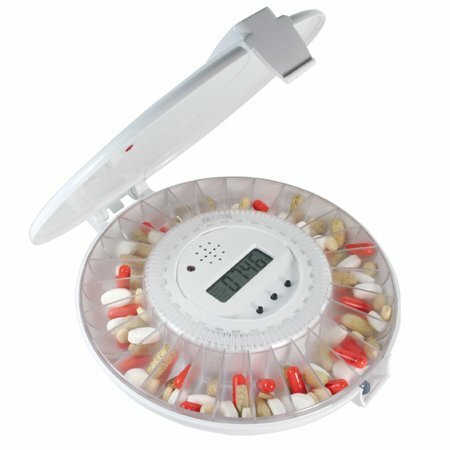 The Active Forever MedELert Automatic Pill Dispenser also includes solid and clear covers, 6 discs which can be customized to indicate days/times. EFFECTIVE MEDICATION ADHERENCE - The MedELert Automatic Pill Dispenser is designed to handle your medication management effectively. You can automatically program the alarm 6 times daily. And with the louder alarm system and blinking lights, even the hearing impaired will be notified. 28 COMPARTMENTS - Each compartment can hold up to 18 aspirin size pills which means you can store up to 504 pills! That's 20% more space than other automatic pill dispensers. SECURE AND DISCREET DESIGN - The custom barrel key reduces the chances of theft or tampering. Plus, you can interchange the clear (worry-free compliance) and white (increased privacy) lids. RETAINS SETTINGS - When changing batteries this unit retains its program settings. Compared to other products, you do not need to set up the MedELert Automatic Pill Dispenser over-and-over. INCLUDES - Active Forever MedELert Automatic Pill Dispenser with 6 alarms and 6 dosage rings, clear and white lid, locking key, and 4 AA batteries.